Calder Northern Division (NMRA British Region) based at Crewe Heritage Centre. Calder Northern Division is one of a number of Divisions within the NMRA British Region, having a geographical membership area including the counties of Cumbria, Lancashire and Cheshire and I.o.M. Meetings are also attended by NMRA members who live in different administrative areas but come to us for their enjoyment, as we are located closer to their home. When the Division was formed it started ﬁrst with meetings at members’ homes and gradually expanded to meetings at local church halls. Members brought along their modules and these were erected at the venue to allow members to run their trains. At the end of the day each took away his module until the next session. In due course a permanent home was sought and this was found close to the city of Manchester; proving to be a very popular venue. 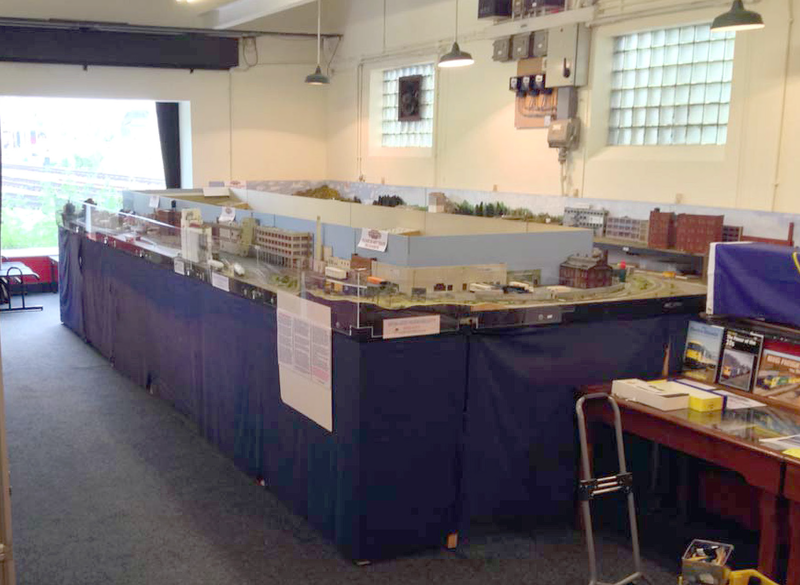 A couple of traders attended each meeting and both an HO and N scale layouts were erected for operation that day. The rental of this building eventually became a problem as our once a month use did not dovetail with that of other groups using the premises, hence our formal move in 2007 to Crewe Heritage Centre some 35 miles to the south. Fortunately our rental here was at a lower rate and allowed us more space to design and build new layouts. 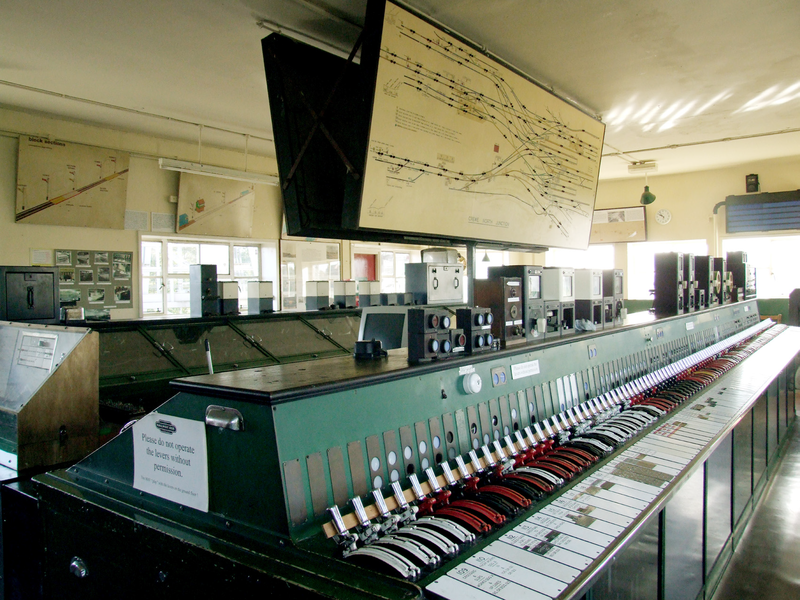 The inside of Crewe North Junction Signal Box – decommissioned in 1985. Note the track plan and the three routes radiating out from the twelve platform (track) station. 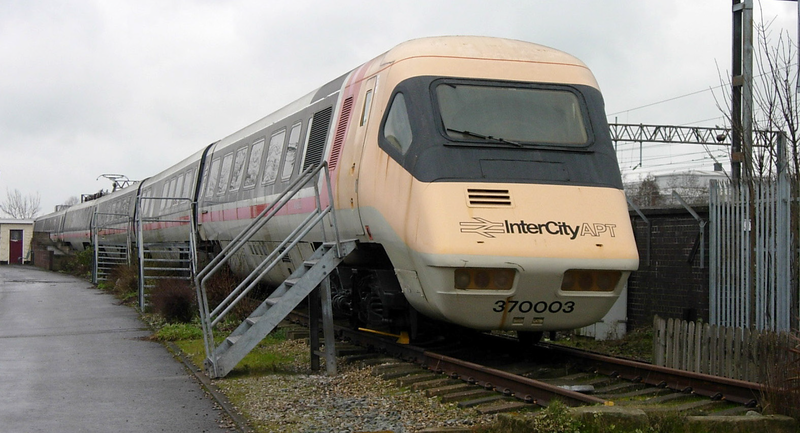 British Rail’s Advanced Passenger Train – the tilting train. Only the power cars were built in Crewe, the remainder built at the Railway Works in Derby. Calder Northern’s monthly club meetings are now held in the North Junction Signal Box (NJSB) at Crewe Heritage Centre. The town of Crewe is in the County of Cheshire, 158 miles North West of London. The town grew around the junction of the Grand Junction Railway and the Birmingham & Manchester Railway in 1837 and a railway locomotive works was initiated in 1840 with the ﬁrst locomotive completed in 1843. In 1846 these companies merged to form the London & North Western Railway. The original works became too small for the new company after a few years and a move to a new site a short distance away was made around 1860. Crewe Railway Works is now owned by Bombardier but it is a shadow of its former glory when over 8,000 men were employed; now no more than 200 people work there. The last of the 7,350 steam locomotives was built in 1958 before production moved full time to build diesel and electric locos. The Crewe Heritage Centre is situated on the site of that ﬁrst railway works and was opened by Her Majesty, Queen Elizabeth II in 1987 to commemorate the 150 years of the railway coming to Crewe. The Heritage Centre is owned by the Local Council and leased to a Trust who manages the site as well as the events and activities. It is open to the public during the season April to October. The Heritage Centre is home to a number of interesting exhibits, namely the preserved Advanced Passenger Train (APT) BR’s tilting train, three signal boxes (North Junction Signal Box; Crewe ‘A’ Box and Exeter West Signal Box) and there is a 7.25” miniature railway with a running length of over 600 yards. Since 1993 a portion of the site has been rented out to L&NWR Heritage Company owned until recently by Pop impresario Pete Waterman (he of Stock, Aitken & Waterman fame plus American Idol) but he has sold his shares in the business to Mr Jeremy Hosking, an investment fund manager, who currently owns or is involved with 12 mainline steam locomotives. It seems that some of the new owner’s activities and a good part of the current work will be moving to a refurbished Diesel Loco facility alongside Crewe Station. 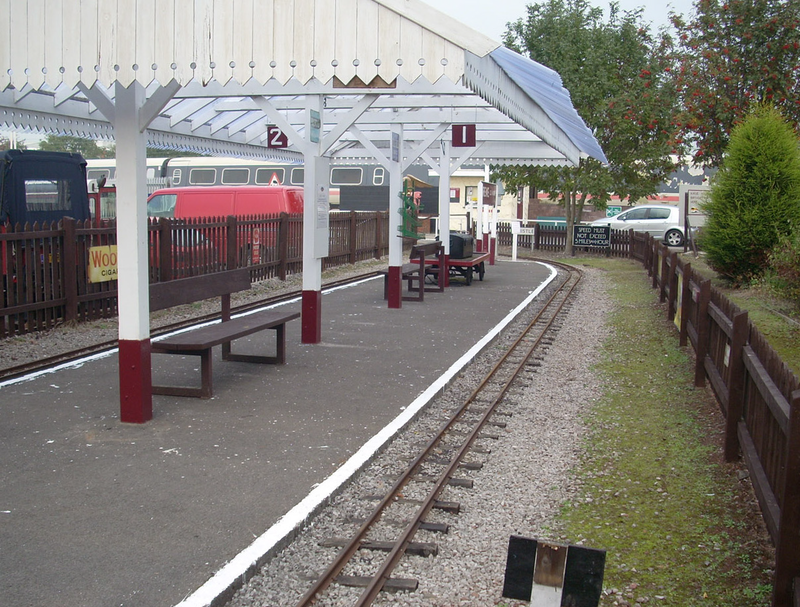 Miniature Railway Station located at the site entrance to the Heritage Centre. “Great Marquess” and support coach departing Crewe. L&NWR Heritage have been mainly involved in restoration, rebuilding steam locomotives which needed work undertaken to the frames, re-tubing and ﬁrebox repairs, so it has been common to see locomotives in various stages of dismantling or erection on the site for long periods of time. With locomotive owners also hiring out their locos we see a number of these on site between operating steam tour specials, when the locos are cleaned, coaled and watered ready for the next outing. The photo of “Great Marquess” and its support coach is seen departing Crewe after working a special service the day before. The loco had reversed off the site into Crewe Station and then been ‘given the road’ to return to its own home in Scotland under its own power. Close up of the North Western Mills HO scale layout. Note the sweeping mainline and passing loop with the industries alongside. The conveyor moves grain from the ”Mornﬂake” unloading facility to the manufacturing plant across the tracks. Calder Northern Division has occupied the ‘Lecture Room’ in the NJSB for the past 7 years. This room is a 1960’s addition to the signal box which was constructed in 1938 and built to withstand bombs. This signal box is the third one on the same site and was decommissioned in 1985 when Crewe Station was remodelled and a new state of the art signal control centre built. The ‘Lecture Room’ has a large picture window which looks south directly into Crewe Station across the junction with tracks passing both sides of our room. In fact the room also sits over a tunnel carrying the independent freight tracks which allow freight trains to avoid passenger trains in the station. Trains pass every few minutes and it is often difﬁcult to concentrate on the models when they go by. We are currently a 100% NMRA group but we do welcome non-members hoping they will see how friendly we are and what great facilities we have. Considering the distance some members have to travel, don’t forget this is England, attendance varies between 20 and 30 members per meeting. Most meetings provide for members to run their own trains or use those belonging to the group. We try to arrange member’s clinics with either guest clinicians or our own members giving the talk or demonstration. 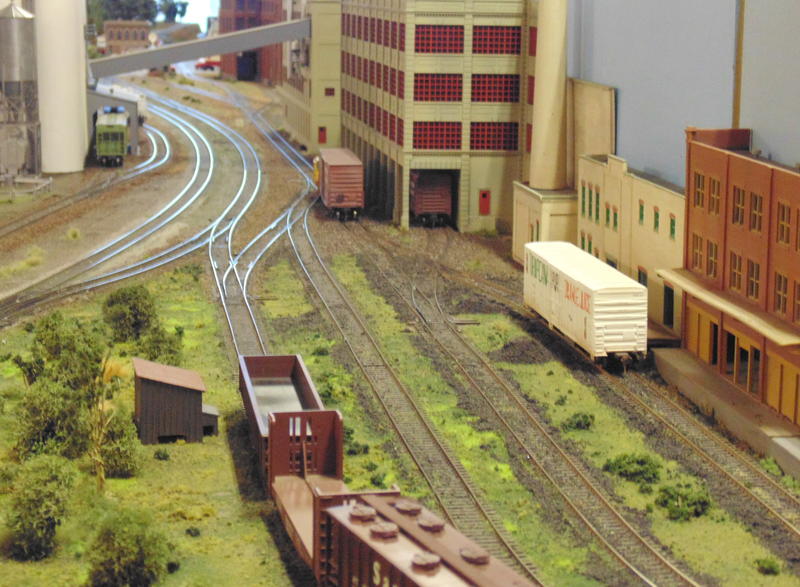 We operate “North Western Mills” a DCC 24’ x 8’ HO layout with a 28’ x 1’6” extension running parallel alongside. It is based around Midwest USA, or Canada if need be, and designed with structures and industries representing the transition era up to present day – the focal point being a grain unloading facility on one side of the main line and passing loop, with a milling and cereal manufacturing element across the tracks. A local Crewe company, who have been milling grain in Cheshire since 1675, have agreed we can use their logo and branding on the layout structures and hopper cars. The layout features a shortline with street running, a yard which is based roughly on that of Crewe in Virginia (we have taken some poetic licence here! ), a passenger depot and a small way-freight yard. On the short line extension there are a number of industries plus a barge slip at the very end. Calder Northern have made contact with the Railroad Museum in Crewe, Va and exchanged information with them; we understand people from L&NWR here in Crewe gave assistance to the Norfolk & Western Railway when the building of railway facilities took place over there between 1884-1888 and this maybe why their town was given the same name. A second DC powered HO layout, “Devil’s Creek” is on display and is based around the period of the 1880’s in Arizona. It was not built by our members but purchased from a young lady and her relative who constructed the layout a few years ago. An N scale layout is under construction but unfortunately those members who were involved in this have either recently ceased their membership or have become inﬁrm, so the layout is stored waiting renewed interest. A ‘Wednesday Gang’ of around 6 or 7 members come along for around 5 hours or so during that day, to work on the layout, enjoy coffee & cookies, chat and sometimes run trains! Occasionally on these days we are able to show school parties around our domain when they come to the Heritage Centre on an educational outing from their schools. Calder Northern members operate the layout each weekend and on and Holiday dates during the season for the enjoyment of the visiting public and this allows us to showcase NMRA and North American trains. It is encouraging when people come along more than once and tell us they come to see the model trains as it is a great animated exhibit on the site. It is strange these days that children prefer to watch the model trains as opposed to the full size ones passing the window! It is also regrettable that many children have never ridden a train in their lives, quite a shock to those of us whose childhood memories are quite vivid about our train rides. View of the lecture room inside the signal box where the Calder Northern Division meets and operates their Northwestern Mills layout. Exterior of Crewe North Junction Signal Box-Note the close proximity to the main running lines which pass either side of the Signal Box. The two low combined brick structures were added in the early 1960’s when the overhead electriﬁcation was being completed and switch equipment was installed. 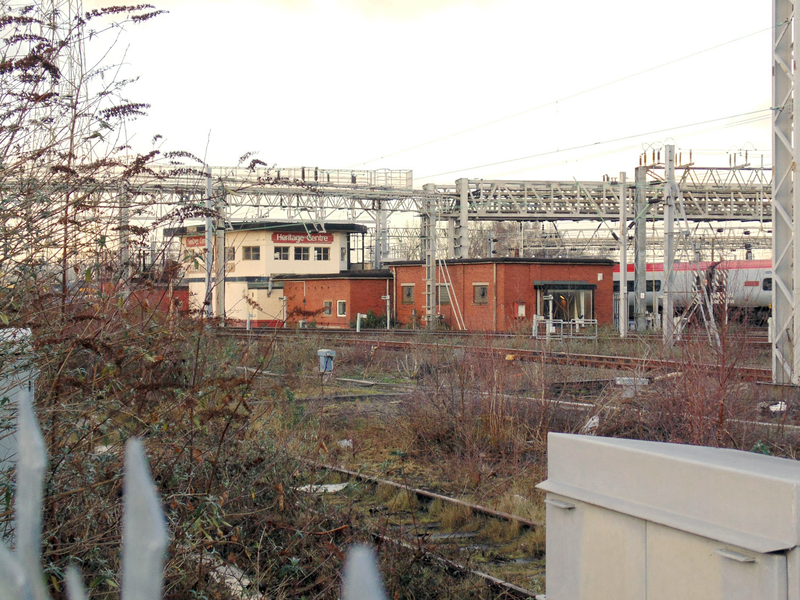 The structure nearest the camera is the NMRA Calder Northern Division clubroom and has the large window looking directly into the Crewe Station approach tracks and platforms. This Signal Box also sits above a tunnel used by freight trains avoiding travelling through the platform tracks. Every two years we endeavour to host a weekend themed train show to raise funds for the group, a Saturday evening dinner at a local hotel for members, traders and exhibitors along with their partners is a feature of these events. Our most recent ‘Fallen Flags’ themed show during October 2014 saw 14 layouts on display to the public, the largest being a 32’x 12’ On30 logging layout demonstrated by a local model club. Traders and displays of ‘Fallen Flag’ railroad models completed the scene this time. Past events have featured themes of both Eastern and Western Roads as well as a Canadian themed event. Train Show visitors were also able to enjoy “Be a driver for a ﬁver (£5)” where they could drive the Heritage Centre’s 1:1 scale Class 03 diesel switcher up the yard under supervision; a very popular attraction! These events are another means of showcasing our models and to hopefully attract new members. So we encourage both NMRA members from around the country to attend as well as welcoming the public in general. Here in the UK there are large followers of the British and Continental railway scene and an American themed event is not of the same interest to some, it is however, generally those who have vacationed in North America and seen the variety of railroad operation that we ﬁnd to be most keen to enjoy our arrangements. Calder Northern hosts its AGM in April each year; a Christmas meet with festive food; plus a Valentine event in February for the ladies, where we provide champagne and chocolates for their enjoyment in thanks for putting up with us and our hobby .